A professional staff of ten caters to your every whim at Little Hill, where a circular swimming patio serves as a delightful focal point. 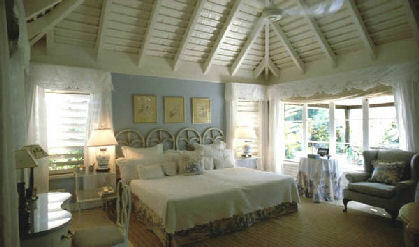 Five spacious, air-conditioned bedrooms, including a private "his and hers" suite, provide the ultimate in refined luxury. Each bedroom has its own deluxe bathroom. with cable television and dining room with an expansive terrace. Guests will enjoy use of the transportation cart, and tennis players will appreciate the private court located on the eight-acre grounds. In addition, this villa offers complimentary airport shuttle service.